Reminiscing about Little Miss A's 1st Birthday Party! A week today, Little Miss A turns 2. Time really has flown by! We've decided this year to just have a simple affair and celebrate with the Grandparents. However, it's got me thinking back to last year and I've realised that I didn't write about her 1st Birthday Party at the time, so now's a good chance! We're not into big extravagant parties as you may remember from the Naming Ceremony we organised for Little Miss A. Therefore we invited just a few local friends and the Grandparents. We decided to have the party at home, the day before her birthday. However, we realised that that day was Mothering Sunday which meant that a lot of people were planning to see their Mums for lunch. So we moved the time of the party to 9.30am! Yes, really that early! Actually at this time in the morning, we had a good chance that the one year olds would all be awake and wouldn't need a nap. To incentivise the adults, we chose to provide bacon and sausage sarnies, pastries and of course there was a lot of coffee available. We were really fortunate that the weather was great that weekend. Thank goodness! I'm not quite sure how we'd have all fitted in the house with space for the little ones to run around. Being able to go out into the garden meant that we could get out all of Little Miss A's big toys. Here she is waiting for her friends to arrive! It was actually the ideal party for this age. And definitely done on a Budget! The main expense was obviously the food but actually we found that doing breakfast worked out really well. We didn't over cater and we weren't stuck eating leftover buffet food for the next few days. My Mum kindly made the cake for us. It was delicious! Each party guest got a party bag with a bath toy and a sponge of their initial for painting etc. However, on the day we also set-up a table for some handprints. I bought some canvases from The Works and a multi-coloured Giant Paint Pad from Hobbycraft. 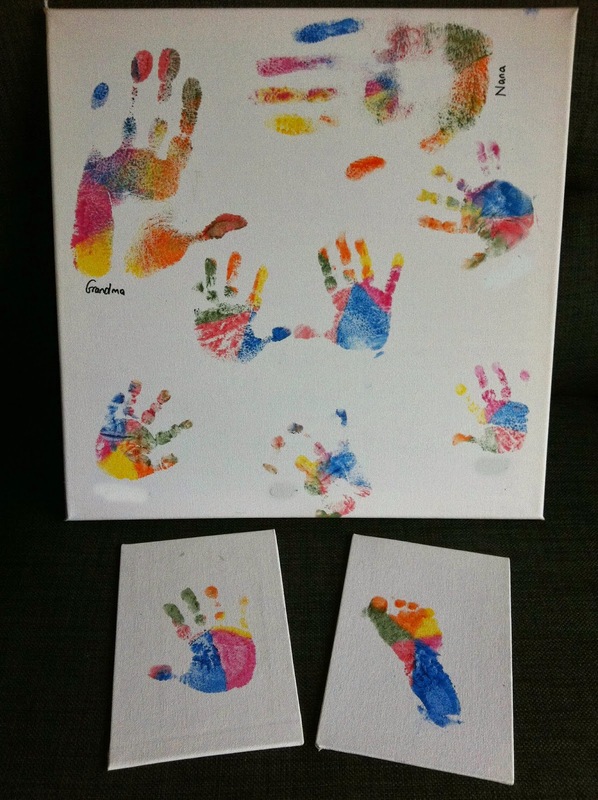 Each child did a handprint on a small canvas board. I also asked them to do another handprint on a larger canvas. For the purposes of the photo, I have blanked out the children's names. These provided a nice little keepsake for the children to take away with them and Little Miss A has a fantastic record of the friends & family that came to her party! One of my favourite things I did in terms of birthday decorations was create a '1' out of photos of Little Miss A. Each month I had taken a picture of her with a letter 'A'. I used this prop just so there was something to give a sense of scale. As you can see, at the beginning the 'A' was almost as big as her but by the last photo she's so much bigger than the 'A'! After the party guests had left, it was time to open all the Birthday presents from the family with the Grandparents. She got some really brilliant presents - the only downside was that most of them were 'big'. She's loved them all but storage is a continuous problem! We have some really great memories of Little Miss A's first Birthday party. And now it's time for her to turn 2! Thanks Jo! The photos did look great. I'm trying to work out how on earth to do a 2 - much harder shape!